“Today, the most precious and auspicious thing we have on earth is this body. Most of us think that our human birth and body are very ordinary and take them for granted. We also take each day that comes and goes in our lives for granted. That is why, though our minds get fresh, new thoughts everyday, the health and vitality of the body keeps getting depleted. This is happening because we do not have enough awareness to cherish the body and connect it to our Soul. Though the secret of how to nurture our Soul and link it with the body and mind has been revealed in the Vedas and Upanishads which are in Sanskrit, we have not understood this truth. Our ancestors were adept at Sanskrit which is the language of the Gods, but now most of us do not know this language. So when we go to the temple, though the priests chant Vedic mantras, take a resolution or Sankalpa and perform the worship on our behalf, we do not understand what they are chanting. So, we have cultivated the custom of asking God to resolve all our problems and fulfill our materialistic desires by giving us health, wealth, fame and success. “So, all of us have come here to link ourselves to God, but we should never visit this shrine mechanically. This is not just a temple; it is Kailasa, the holy abode of Lord Shiva Himself. We should be completely aware of the glory and significance of this temple if we want to tune in to His Grace completely. This knowledge will make devotion flow spontaneously from our hearts. We may know the historical background of this temple, but what is its spiritual secret? Though Lord Shiva is consecrated in many temples, this one is extremely unique. Here He has manifested Himself both as the Akasha Linga and as Ananda Nataraja. “What is the significance of these two manifestations of Lord Shiva? The Sages have always been aware that God is primordial and eternal. He creates, sustains and dissolves the Cosmos into Himself according to His own Divine Will. They know that He is all pervasive, all knowing and all powerful. It was to emphasise this truth to all of us that Lord Shiva manifested as the Akasha Linga or column of etheric space which is invisible to our physical eyes. As the Akasha Linga, He is saying – “The whole Brahmanda or Cosmos is My Form. If I manifest before you only as a physically visible deity, you will keep trying to gauge Me with your puny logic and intellect. How can you measure Me when I am infinite and immeasurable? How can you gauge Me when I am beyond all forms and attributes? Become aware that you are My reflection. Understand your own true nature and realise that you are also infinite and eternal.” However, being aware that as human beings we need a visible form to worship and relate to, He manifested as Ananda Nataraja as well. Chidambaram was known to all the Sages and Saints as Tillai Vanam or Garden of Dance where Ananda Nataraja who is the Lord of the Cosmic Dance of Bliss generates and establishes joy in the world through His ecstatic dance everyday. Through this form He teaches us how to link the body and mind with our Soul to experience Ananda or supreme bliss. “When we come to the temple, we should invoke God through our devotion and surrender as well as traditional rituals. When we have an intense belief without any expectations, it is called surrender. When we surrender to the Divine Will, instead of praying for worldly things we simply say – “Lord Shiva, I ask for nothing but Your Grace.” When we have His Grace, we have everything. When His Grace surrounds us, we will be able to think, speak and act perfectly in each and every situation. So, our lives will be completely free from troubles and problems. To get this kind of jnana or knowledge, we do not need erudition or wealth; we need only intense devotion and surrender. This is the attitude with which Sages like Patanjali, Appar, Sundarar and Manikya Vachakar worshipped Lord Shiva here to obtain His jnana and share it with the world. Do we have this kind of devotion? We certainly go into the temple with devotion, but as we come out, thoughts of our family, work and problems crowd into our minds. As soon as the temple disappears from our sight, we forget God and our devotion evaporates into thin air. How can this be true devotion? If our devotion were true, it would pulsate in our hearts with the same intensity all the time. “When the mind becomes the Kanaka Sabha, all the 330,000 million forms of Divinity will come and abide there, transforming it into the Deva Sabha or Sabha of Gods. Within this temple, the thousand pillared hall where we are all sitting is called the Raja Sabha. Searching for this Sabha, Sage Appar once asked Lord Nataraja – “Lord, where is the Raja Sabha in Your Tillai Vanam?” Lord Nataraja replied – “My Raja Sabha is right where you are standing now. Whenever you move, it moves with you. Whenever you stop, it envelops you. Be aware that as soon as you establish Me in yourself, your own body becomes My Raja Sabha. Once you consecrate Me there permanently, I will begin to dance the Ananda Tandava within you and your heart will overflow with bliss. Then, instead of walking you will dance with joy and every place you go to will become the Nritta Sabha or Sabha of Dance.” The Supreme Bliss we experience may be expressed in innumerable ways. When we sing a bhajan or kirtan, we are in bhakti yoga or the yoga of devotion. When we shed tears of bliss before God, we are in kanaka yoga. When we dissolve ourselves in bliss and dance in ecstasy, we are in ananda yoga. Lord Nataraja will bless each one of us with the yoga that is most appropriate for us. Such is His Grace. Such is the power of Chidambaram, because it is the pulse point or power centre of God on Earth. Every kind of yoga or spiritual practice begins from here because it is generated by the Ananda Tandava or Cosmic Dance of Nataraja. Every moment of joy we experience, every minute of peace and contentment in our lives, every good or divine thought we get comes from His Tandava. If people are still thinking of God today, even in this materialistic age, it is because of Lord Nataraja’s Divine Dance of Ecstasy. Based on our karma and the circumstances of our lives, the divine thoughts that we get may vary, but each one of them undoubtedly comes from Him. We should be aware of this wonderful Chidambara Rahasya or mystical secret of Chidambaram when we worship Lord Nataraja here. “All the five Sabhas in the temple are full of divine power today because of the devotion that our Sages established through their prayers, worship and austerities. Everyday, we too offer bilva leaves to Lord Shiva and tulsi leaves to Lord Vishnu who is also consecrated here. While this is ritualistically correct, we must remember that the leaves we offer will wilt in a few hours. It is the devotion we establish that will enhance the power of this temple and linger on to ignite the hearts of the future generations. If our hearts are overflowing with devotion today, it is because our Sages and elders filled this holy place with their divine love for Lord Shiva. In fact, every time we come here, these Sages come through us to worship Him. So whenever we offer our worship to Lord Shiva, we are not praying only for ourselves; through us the Sages are also praying for the welfare of the world. They are praying that with Lord Shiva’s Grace, His divine yoga and intense devotion maybe established on earth. “Physically, everything in this world changes with the passage of time. This sacred abode of Lord Shiva looked totally different when it was Tillai Vanam. The temple we see today is the loving handiwork of thousands of craftsmen under the devoted patronage of so many kings. As years pass, many more deities may be consecrated and many new shrines maybe be added. So, five hundred years from now this temple may look drastically different, but the devotion we establish today will remain fresh and vibrant forever. We are so particular about the external form of the temple where we enshrine God. Many of us may think that we are doing God a favour by building a temple or contributing to His worship. However, God does not need a temple. He does not require our worship, wealth, name or fame. He has no desires or expectations. All that He wants from us is our divine thoughts, purity, faith and devotion. Devotion plays a crucial role in our lives. It is the link that connects the body and mind with our Soul. Devotion is the powerful vibration that invokes God and draws His attention. When we generate this kind of intense devotion it awakens Lord Shiva from His deep meditation, and makes Him dance in blissful abandon transforming our lives into a joyful celebration. “We celebrate this Arudra Festival in the auspicious month of Margazhi every year to express our gratitude to Lord Shiva for dancing His Ananda Tandava every day so that human beings can enjoy peace, contentment and bliss. One year on earth or Bhuloka is equivalent to one day in Deva Loka or the World of Gods. So, when we celebrate any festival once a year, it is tantamount to celebrating it everyday in Deva Loka. In this way, our whole spiritual culture and tradition is designed to create a harmonious relationship between our body, mind and Soul. All the Vedic hymns like the Rudra and Chamaka are chanted to bring about this harmony. Even our food habits play a major role here. The Scriptures tell us that we should always eat a morsel less than the full capacity of our stomach. If we overeat, most of the oxygen in our breath is used for digestion and very little is available for the other activities of the body. So, the inertia of the body and mind increases and our awareness of Divinity decreases. We should eat just enough to generate the physical vitality and mental purity which are necessary to experience bliss. That is why Sage Patanjali said – “Always be aware of what you eat and how much you eat.” Plenty of salt, astringents and spices may make our food very tasty, but they also make our minds restless and hasty. This affects our concentration and we can no longer keep our minds effortlessly focused on God. Even the taste of the most delicious dish in the world pales before the ambrosial taste of supreme bliss. How long does taste linger on the tongue? A few moments. How long does the taste of bliss linger within us? For ever and ever and ever…To propel us in the direction of this perennial bliss, Sage Patanjali advised – “Eat one handful for each of the five vital airs in your body everyday.” So, if we want to experience the bliss that Lord Nataraja is generating for us everyday, we must first exercise a restraint in our food habits. 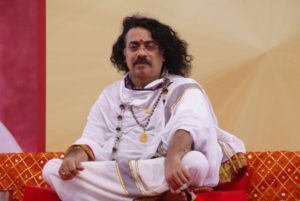 “This is how Sage Patanjali gave us the rich heritage of Ashtanga Yoga or the Eightfold path of Yoga where he systematically describes the sadhana techniques we should practice to activate our inner fount of bliss. The eight limbs or steps of Yoga prescribed by Him are Yama, Niyama, Asana, Pranayama, Pratyahara, Dharana, Dhyana and Samadhi. Yama is gaining control of our mind and intellect. Niyama is the foundation of discipline on which our lives should rest. Asana or yogic postures play a key role in regulating and controlling the senses, breath, vitality, intellect, mind and many other subtle energies that course through the body. Pratyahara, is the voluntary withdrawal of our senses from all stimuli. Pranayama is the control of our vital life force using our breath. This naturally leads to Dharana which is complete focusing, concentration or awareness. The seventh step isDhyana or meditation, where the mind is fully established in Divinity. Meditation culminates in Samadhi or complete dissolution of our identity in Divinity where we become Sat-Chit-Ananda or the very personification Supreme Bliss. 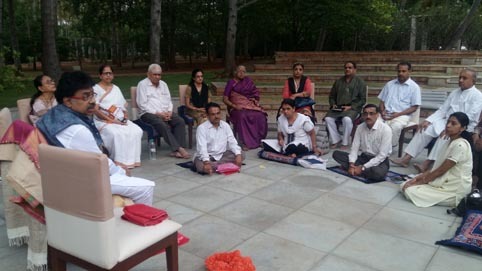 This divine yoga which originated here in Chidambaram has been adopted even by the Yogis in the Himalayas who have made Ashtanga Yoga the very basis of their lives. By following these sadhana techniques step by step, they have established themselves in bliss. By using Ayurveda, they have maintained the health and vitality of their bodies. However, though we are truly blessed to be living in Chidambaram itself, we have forgotten all about Ashtanga Yoga and are making no effort to follow it in our lives. When we follow these sadhana techniques given to us by Sage Patanjali, Lord Nataraja will come and dance the Ananda Tandava in our hearts. With Him will come His divine consort, Devi Shivagami who will bring all the Ashtalakshmis or eight Goddesses of Prosperity with Her. Devi Shivagami will remove all the problems and worries from our minds and fill us with endless joy by giving us the vision to witness the Ananda Tandava of Lord Nataraja. “All of us have been born to experience this bliss. Those of you who live here should make the most of this divine opportunity. If you come to the temple every morning and evening to practice pranayama or breathing techniques for 15 minutes, you will receive abundant Grace from Lord Nataraja. Lord Shiva’s energy is ever present in each one of us as our breath and the quality of awareness. If we want to go beyond the body and senses, and cultivate the awareness to experience our Soul, we must use our breath. Pranayama will tune the body and mind to our Soul. The process of establishing our breath in the body is called Kriya Yoga. When we use our breath in this way, we will get the knowledge of Sage Appar and the bliss of Sage Patanjali. The whole town of Chidambaram is pulsating with the energy of Lord Shiva because He dances here in total bliss everyday. Remembering this, we should chant one syllable of ‘Namah Shivaya’ with each step as we walk up the five steps to the Chit Sabha to have the darshan of Lord Nataraja. Then, we must sit down in the Deva Sabha and chant this sacred mantra 108 times intertwining it with our breath. “How do we intertwine it with our breath? I will now teach you how to do this. Sit straight and close your eyes. Place your hands on your knees. As you inhale, slowly draw in as much air as possible while chanting ‘Om’. Now retain your breath inside for a while. Then, as you exhale, chant ‘Na – mah – Shi – va – ya’ slowly. Let us chant ‘Om Namah Shivaya’ together in this way for a few minutes. Listen to the chanting of this mantra by Pujya Guruji below………..Relax. Breathe normally. Slowly open your eyes. When you chant this every day, keep the divine form of Lord Nataraja in your mind. “When Sage Patanjali asked Lord Nataraja why He danced the Tandava, He said – “While generating Ananda, I also set right the breathing of all human beings. Write down this secret and teach them the proper way of breathing so that they can tune in to My Energy. What you write will become a great Shastra or Scripture.” Our breath is the greatest treasure we have because it is breath that gives us life. When we offer this life to Lord Shiva with complete devotion, He will grant us His Darshan and the boon of Supreme Bliss. Many of us think that it is very difficult to obtain God’s Darshan in the Kali Yuga or dark materialistic age. In actuality, we can create any Yuga we like by generating the right kind of vibrations. When we generate vibrations of devotion and spend our time in the company of other bhaktas or devotees, we are creating the Dwapara Yuga. If we have an intense yearning to meditate, we are creating the Treta Yuga. When we look at everything through the eyes of knowledge, recognising the divinity in all beings, we are creating the Satya Yuga. When we serve everybody selflessly without any expectations, we are transforming the Kali Yuga into the Dharma Yuga or Age of Righteousness. “So, by establishing the mind in the right bhavana or emotion, we can overcome the drawbacks of the Kali Yuga. To link the microcosm of our Soul with the macrocosm of the the Cosmos, Lord Shiva manifested Himself through the Panchabhuta Lingas. Each Linga represents one of the five basic elements of earth, water, fire, air and ether. As we are all aware, Chidambaram is the abode of the Akasha Linga or element of ether. Sage Patanjali said – “Whenever you go to have a darshan of one of the Panchabhuta Lingas, have the awareness that the whole Cosmos including your body is made up of the five basic elements. When we die, our body returns to the five elements, and our Soul returns to God. 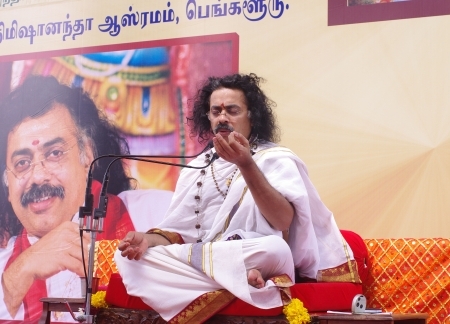 So, when you come to Chidambaram, come with the Sankalpa of harmonising your body and mind with your Soul so that you can be established in Ananda.” If we practice the breathing technique that we learnt today with devotion and surrender, we will also be granted a darshan of the Ananda Tandava that Sage Patanjali had. Only when you have many, many lifetimes of good karma can you live in a sacred place like Chidambaram. People come from all over the world to experience the Bliss which Lord Nataraja pours out to you every moment. May the Chit Sabha, Kanaka Sabha, Deva Sabha, Raja Sabha and Nritta Sabha be reflected in you all the time. May all of you receive the Prasada of love and bliss from Him constantly. May you be blessed with the vision of His Divine Cosmic Dance of Bliss like all the Seers and Sages. May your Supreme Bliss flow to the whole world. May all beings be happy. Jai Matha. Hari Om Tat Sat.